Finally I have pictures of BB Couture polishes for you. 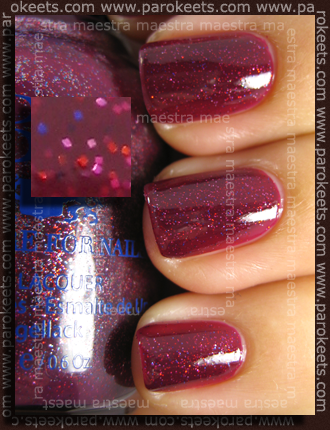 Dragon’s Breath has a red-purple base with lots of silver, blue and red glitter. Two coats in the picture. 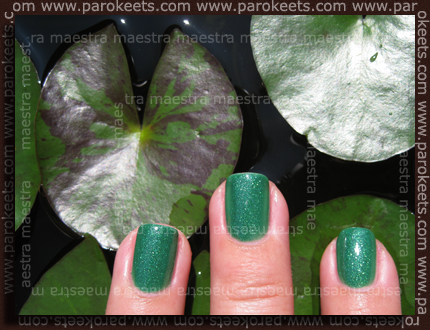 Frosty Meadow has a green jelly base with lots of gold-green glitter, which is similar to the one in Dragon’s Heart. Frosty Meadow went on a bit sheer. I mean, I managed to go away with just two coats but you’ll probably need three. Two coats in the picture. Sea Of Cortez has a jelly blue base and lots of light green glitter. This glitter again is similar to the glitter in the polishes shown above. This shade is the most sheer out of all three shown here, so I needed three coats to make it opaque. All these shades are stunning! The jelly base and the glitter is a winning combo. I mean, the nails with these polishes on sparkle like crazy in the sun. I love it! The consistency on these three polishes was a bit runny, but I didn’t have any difficulties applying them. The brush has a “regular” shape and is soft. I mean, I usually prefer the regular brushes over the flat and wide ones, so I loved the BB brush. The bottle alone isn’t anything special, but it’s functional and I quite like it. I have to stress out that the bottle contains 18ml (0,6 Oz.) of “the good stuff”, which is a lot. The price at Overall Beauty is $9. Kim (the owner) from Overall Beauty was very kind and informed me about every step of my order and delivery. I’m very satisfied with the customer service at Overal Beauty, although they spelled my last name a bit wrong and also the address on the package was wrong. Luckily the postman already knows me, so the package found its way to me. Although I leave in the biggest city in the country and its not usually the case that the postman knows all of the people on his route. So I was very lucky to get my goodies! I really don’t like to write about the wear time of the polishes as I change my manicure on a daily basis, but I was a bit disappointed about BB Coutures, because Frosty Meadow and Dragon’s Heart chipped within one day on the “hardest working” nails. The drying time on these is average. Nothing spectacular here. This formula will knock your socks off! It’s a 4-in-one with base coat, top coat, nail strengthener and color in one bottle. I was positively surprised when removing these polishes. I mean, for so much glitter, the removing is super easy and fast. I’ll definitely buy some more BB Coutures as they have some great and probably unique shades. What about you? Do you like the colors? Do you have any experience with the BB Couture For Nails brand? Share your experience with me. BB Couture nail polishes arrived! :wub: I love BB Couture Polish! My favorite is Poison Ivy. I have all of their greens. I also have the same ones you do. I didn’t notice any chipping right away. I chipped on day three. I also used a base and topcoat. Only because it’s instictive for me to do so. I really like the blue bottle top. I think it makes it look different that other polishes. Kim is a sweetheart. She emailed me right away after I had ordered. Also she credited me immediately for a postage charge. They have excellent customer service. I also got the latest Hot Rod collection. I love all the colors especially the red. I can’t remember the shades offhand. I will continue to order from OverallBeauty. I also love the glitter in these shades. They are amazing. The red in the Hot Rod collection has a pink glitter in it. Really beautiful when the light hits your nails. Can I ask what top/base coat you used? I hear people say that if you find the right base/polish/top combo, you can make any polish last a long time and it sort of makes sense to me, not that I’ve ever experimented with base/topcoats myself-I use the same ones with all polish brands. Zanima pa me, kakšen je Sea Of Cortez v primerjavi z Essence Pool Party?